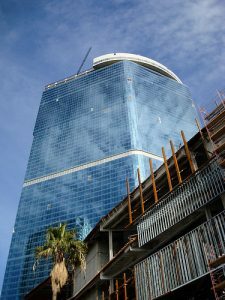 VACANT FONTAINEBLEAU IS SOLD: The unfinished 63-story towering blue building on the south end of the Strip sitting on roughly 27 acres of land has been sold to a partnership led by New York-based real estate company Witkoff for $600 million. The site near SLS has been dormant since 2009, about two years after privately held Fontainebleau Resorts LLC began work on the $2.9 billion, 3,900-room project. Billionaire Carl Icahn and his firm, Icahn NV Gaming Acquisition LLC, bought it out of bankruptcy in 2010 for $148 million. Future plans are still up in the air. DIRT DOG OPENS SECOND VEGAS LOCATION AT GRAND BAZAAR SHOPS: Recently opened Dirt Dogs at the Grand Bazaar Shops at Bally’s makes it the second Las Vegas location for the LA-based doggery. The creative menu is inspired by Los Angeles street food featuring one-of-a-kind dogs, elote, fried desserts and more. 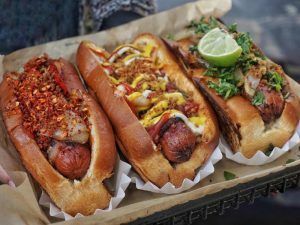 Proclaimed “the official hot dog of Los Angeles,” the menu stars are the bacon wrapped 100 percent beef dogs with a multitude of toppings and sides such as Flithy Fries and sweets like Horchata Ice Cream. Outlet opens at 10 a.m. daily and closes at midnight and 2 a.m. Thursday-Sunday. The name Dirt Dog is because CEO Timothy Cam in the early ‘90s was working in downtown LA with limited dining options and discovered a lady selling bacon-wrapped hot dogs on a cart adjacent to a traffic-heavy dirt road. His mother advised against eating them because of the dirt and did anyway and loved them. FORUM SHOPS DEBUT NEW 85-FOOT DIGITAL STRIP MARQUEE” Marking its 25th anniversary this year, The Forum Shops at Caesars Palace home to more than 160 distinctive retailers and restaurants, now has a new, state-of-the-art digital marquee conceived and designed by Simon Property Group and built by YESCO. The double-faced sign is 41 feet wide, weighs 158,000 pounds, stands 85-feet tall and is covered with an abundance of Yaham LED panels. 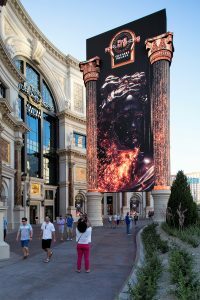 The sign simulates a classical Roman building facade with Corinthian-inspired columns, but with a surface area of more than 6,000 square feet of LED and can be programmed instantly. The freestanding sign enables pedestrians to pass through underneath it along the sidewalk. HOFBRÄUHAUS HOSTS OKTOBERFEST WITH CELEBRITY KEG TAPPINGS : Munich, Germany’s annual celebration since the 19th century is Oktoberfest, the world’s biggest beer party. Hofbräuhaus Las Vegas’ 14th annual celebration will run Sept. 15-Oct. 31 and feature Oktoberfest Stein-Holding contests every weekend, live entertainment, bar games, prizes and more. Hofbräuhaus is the only place in Las Vegas where beer lovers can taste the same Oktoberfestbier served at Oktoberfest in Munich. The restaurant will also hold celebrity keg tappers on weekends starting with Siegfried & Roy® Sept.15. Confirmed celebs so far include: BMX rider Ricardo Laguna Sept. 16; stars of TV show “Tanked” Sept. 22; “Raiding the Rock Vault” cast Sept. 23; Chippendales Sept. 29; magician Murray SawChuck Sept. 30; “Legends in Concert” cast Oct. 7; Australian Bee Gees Oct. 13; comedy magician Nathan Burton Oct. 14, Fantasy girls Oct. 27; and hypnotist Anthony Cools Oct. 28. RAISING CANE IS RAIDERS’ FIRST LAS VEGAS SPONSOR: Local franchisee Raising Cane’s Chicken Fingers became the community partner and first sponsor for the Raiders in Las Vegas. 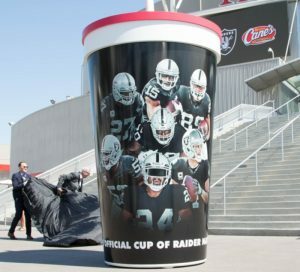 To celebrate, the restaurant chain unveiled the official cup of Raider Nation in the form of a 10-foot replica in front of Thomas & Mack Center. The official cup of Raider Nation in two designs – logo and image of team’s starting lineup – is available with the purchase of any large soft drink or Caniac Combo at all 12 Raising Cane’s valley locations while supplies last. Raising Cane’s demonstrated its allegiance to the Las Vegas community with a check to UNLV Athletics for $10,000. Raising Cane’s from Thursday-Sunday, Sept. 7-10 will celebrate the first game of the season with “Tailgate Parties” at all locations. Caniac Club members can participate in a football-themed Swipestakes to win free Raising Cane’s for a year, a chair, swag and a Raiders Jersey. Guests will also receive a free jug with any tailgate purchase. WIN A BOWLING PARTY WITH ANDREW W.K. BEFORE HIS SEPT. 30 SHOW: Party rock legend Andrew W.K. 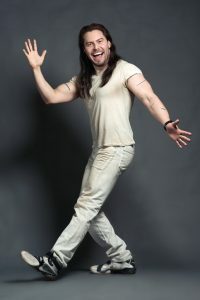 is bringing his “The Party Never Dies” full-band tour to Brooklyn Bowl on Saturday, Sept. 30, at 7 p.m. Brooklyn Bowl and Smash Magazine are pairing up to offer two winners the opportunity to bowl – party-style – with Andrew W.K. and to his show with Rayner. To enter, visit Brooklyn Bowl’s website and scroll down to the contest page. Winners will be notified Thursday, Sept. 14. YELLOW BRICK ROAD STARTS RESIDENCY AT SLS’ SAYERS CLUB: SLS Las Vegas will host Yellow Brick Road, a popular local classic rock tribute band, Thursday nights at The Sayers Club starting Sept. 7. Admission is $10 for the public and $5 for Club 52 members and hotel guests. Doors open at 8 p.m. with shows at 9 p.m. Bottle service and VIP tables are available for purchase. 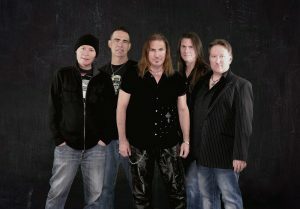 Originally an Elton John cover band, the group has been rocking and rolling as a local sensation for more than 20 years. FORUM SHOPS HOST MEXICAN INDEPENDENCE DAY CELEBRATION: The Forum Shops at Caesars Palace, in partnership with InVEGAS Magazine, will be the exclusive location to ring in El Grito for the Mexican Independence Day weekend celebration on Friday, Sept. 15 at 8 p.m. The Forum Shops will host the official opening ceremony with a celebratory ringing of the bell by Mexican Consul Alejandro Madrigal along with a Mariachi band and traditional folkloric dancers staged atop the reflecting pool near the spiral escalator. The public is invited to join in on the free event. More than 50 mall retailers and restaurants will present special offerings to guests who check-in at the InVEGAS/El Grito hospitality and welcome desks and pick up an INVEGAS wristband. 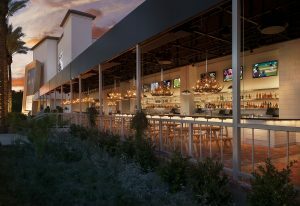 PRIMM & PROPER OPENS AT PRIMM VALLEY RESORT & CASINO: Primm Valley Resort & Casino as part of its remodel has opened a new 24/7 restaurant called Primm & Proper serving American favorites for breakfast, lunch, dinner and late night. The airy environment features oversized plush booths, sandstone brick decor and striking red windowpanes along with a neon sign lighting up the phrase “good food, good people good times.” Located in Primm, Nev., about 40 minutes from Las Vegas, the resort finished a $3.5 million room renovation last November. LAS VEGAS LIGHTS FC IS OFFICIAL NAME FOR PRO SOCCER TEAM: The official name for the 33rd second division professional soccer team to join the United Soccer League (USL) is Las Vegas Lights Football Club (FC), which was picked by more than 10,000 votes from fans with more than 1,000 submitted ideas. Team logo designs are being accepted for consideration through Friday, Sept. 8 at LasVegasLightsFC.com. The team will begin its inaugural season in March 2018 with all matches held at Cashman Field, located in Downtown Las Vegas. To ensure a seat for every game, a $20 deposit for season tickets is required on a first-come first-served basis. Lifehouse and SWITCHFOOT will be together for the first time on their “Looking for Summer” Tour with a stop at Mandalay Bay’s Beach Concert series on Friday, Sept. 8. Up-and-coming songstress Brynn Elliott will open. Singer, songwriter and activist Melissa Etheridge is returning to Las Vegas for a performance at the Pearl Concert Theater inside the Palms on Saturday, Sept. 9 at 8 p.m. Tickets start at $40. Latin pop artist Luis Fonsi will appear the night before with tickets starting at $45. Comedian and three-time Emmy Award® winner Louie Anderson will perform his stand-up on Sept. 15 and 16 in the Rocks Lounge at Red Rock. The Surfaris, Eddie Holman, 1910 Fruitgum Company and Original Lead Singer of The Crystals La La Brooks will each bring their top hits to the End of Summer Concert at Cannery’s The Club on Saturday, Sept. 9. “Ricky Nelson Remembered” starring his identical twins Matthew & Gunner Nelson will bring back great memories of their superstar father on Saturday, Sept. 9 at 8 p.m. in the Chrone Showroom at Santa Fe Station. Tickets start at $25. Academy Award nominated actor Owen Wilson was recently spotted at The Beatles™ LOVE™ by Cirque du Soleil® at The Mirage and visited with the cast. Season Nine winner of NBC’s “America’s Got Talent” and star of his own show “Magic Reinvented Nightly” at The LINQ hotel, magician Mat Franco appeared on AGT last week at the Dolby Theater in Los Angeles. Global superstar Jennifer Lopez has added 32 performances in 2018 from February through August for her record-breaking headlining residency, “Jennifer Lopez: All I Have” at The AXIS at Planet Hollywood. General ticket prices range from $59 to $229. In addition, Lopez recently released her single, “Ni Tú Ni Yo,” featuring Gente de Zona. The song will be featured on her upcoming Spanish-language album. To keep up with ticket demand for their hit residency, “Together in Vegas” at The Colosseum at Caesars Palace, country music superstars Reba McEntire, Kix Brooks and Ronnie Dunn have added a show on Sunday, Dec. 10 during National Finals Rodeo to close out their final run of 2017. Qingdao Song and Dance Theatre will present “Across the Pacific performed by Red Sorghum,” an award-winning Chinese dance drama, at The Orleans Showroom on Tuesday, Sept. 12 at 7:30 p.m. Tickets start at $25. Veteran Las Vegas producer, talk show host and syndicated photo journalist Sandy Zimmerman, who covers celebs, shows, restaurants and events, is now airing “Sandy Zimmerman’s Las Vegas TV” on Facebook@szlvtv. www.facebook.com/szlvtv. After a two-year hiatus, Westgate has reintroduced its poker room with six Texas hold’em cash game tables. The room located next to the sports book closes for six hours every morning. Scientist and author Dr. Michael Voegele will discuss the history of the U.S. high-level radioactive waste disposal program with a focus on Yucca Mountain on Friday, Sept. 8 at 6 p.m. at the National Atomic Testing Museum. Cost is $5 for non-members and free for members. Model Carmen Ortega and DJ C.L.A. will host a late-night, post-fight party at Crazy Horse III on Saturday, Sept. 16. Hamptons at Tivoli Village will open on Wednesday, Sept. 6 at 11 a.m. featuring two levels of industrial-chic interior design with vintage touches to create a space of sophisticated ambience. The seventh monthly Culinary Road Trip dinner event with Chef Scott Commings at the Downtown Grand will be a fundraiser on Wednesday, Sept. 27 with “Tastes of Texas” and 100 percent of all ticket sales going to benefit Hurricane Harvey victims. Normally the dinner is for 25 guests but it will be expanded for up to 150 people and move to the Fremont Room from 6-9 p.m. Tickets to the multi-course dinner are $50. In addition, Freedom Beat will continue to support the hurricane relief efforts by donating $2 from every lunch and dinner entrée purchased Sept. 1-30. The 5th annual Sip & Savor event will be held for the last year at Spago inside The Forum Shops at Caesars on Thursday, Sept. 21. The evening with partners at Southern Glazer’s Wine & Spirits will showcase the Wolfgang Puck Fine Dining Group culinary team in an effort to increase awareness and raise funds for Keep Memory Alive. Tickets are $175 to $225 VIP. Oscar at Oscar’s is a casual version of the bimonthly Oscar Goodman Dinner Series that offers guests a three-course plated dinner experience paired with red and white wines as well as the signature Oscar Goodman Martini. The next Oscar Dinner Series will be Thursday, Sept. 14 at 6:30 p.m. with the topic “Humor in the Middle of Mayhem and Murder.” Cost is $150, call 702-386-7227. Umami Burger, Beer Garden & Sports Book at SLS is hosting Seattle brewer, Elysian Brewing Company, for its “Tap Takeover” in September. The offer is four draft selections: Superfuzz Blood Orange Pale Ale; Space Dust IPA; Split Shot Espresso Milk Stout; and Hawaiian Sunburn Pineapple Habanero Sour. Drafts are $9 for 14-ounces, $15 for 25-ounces and $27 for a 50-ounce souvenir yard. On Tap Takeover Tuesdays, purchase any Tap Takeover 14-ounce draft and receive one second draft for free. Hash House A Go Go’s 6800 West Sahara location turns 12 in September. To celebrate, the location is offering a dozen of its most popular items for $12 for the first 12 days in September. Each day is a different special. Wines Du Jour, the nationally syndicated food and wine pairing radio show featuring a weekly winery and three of its wines with an intimate invited guest audience at an upscale restaurant, is celebrating its sixteenth year on Thursday, Sept. 7 at Del Frisco’s Double Eagle Steak House on Paradise from 7 to 8 p.m. The anniversary show with host Chef Les Kincaid will highlight three wines from Joseph Phelps Vineyards. As part of the Family Meal dinner series, culinary director John Courtney of Carson Kitchen will team up with managing partner Mark Purdy of Andre’s Bistro & Bar for a special pop-up dinner on Tuesday, Sept. 19 from 7:30 p.m. to 12:30 a.m. at Andre’s Bistro & Bar on S. Fort Apache Road. The meal will be a traditional Low Country Boil served family style with one complimentary cocktail. As an event sponsored by Tito’s Handmade Vodka, $4 from every ticket will benefit Monday’s Dark. Cost is $40; call 702-798-7151 for reservations. The inaugural “Last Friday, Just Add Water Street” event kicked off on Friday, Aug. 25 at the Henderson Events Plaza & Amphitheater on Water Street. Last Friday, a nonprofit event, is scheduled to take place the last Friday of each month in downtown Henderson from 7-10 p.m. The free foodie, art, music, and crafts event, will benefit three different local charities each month. Throughout the month of September, United Blood Services is giving away two free good-any-day entries to Shriners Hospitals for Children Open for all patrons who donate blood to the nonprofit. The PGA TOUR event stops in Las Vegas Oct. 30–Nov. 5 at TPC Summerlin. Donations are accepted at all United Blood Services’ Southern Nevada blood drives and donor centers. 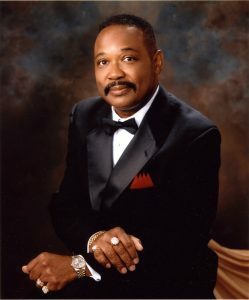 To make an appointment, call 877-UBS-HERO or visit www.BloodHero.com. “Less is S’more” is this year’s Girl Scouts of Southern Nevada’s signature cocktail to be served during the fundraising 2017 Dessert Before Dinner Gala on Saturday, Sept. 9 at Caesars Palace is created by Southern Glazer’s Wine & Spirits of Nevada. Super Summer Theatre and house seats will present Broadway Under the Stars, a third annual fundraising gala at Spring Mountain Ranch State Park on Sunday, Sept. 10 at 6 p.m. and VIP reception at 5 p.m. Entertainment at 7 p.m. will feature headlining talent Clint Holmes, Kelly Clinton, Randal Keith, Kelly-Anne Gower, Travis Cloer along with live music and more than 50 Las Vegas performers. Tickets range from $75 to $150 for adults and $40 for children 6-17 years of age; visit www.supertheatre.org. For the month of September and in honor of National Childhood Cancer Awareness Month, a special Candlelighters doughnut is featured at all five Krispy Kreme Las Vegas locations. Eight children participated in a contest to create the special doughnut. For each one sold, 50 cents is donated to the organization. Lyft Las Vegas partnered with Acelero Learning – Clark County Head Start program and Divine Light Center for Empowered Living to provide 1,000 backpacks and other necessary school supplies to Las Vegas children in need returning to school. The Juvenile Diabetes Research Foundation will collect unused, unopened, and in- at the JDRF office, 5542 S. Fort Apache Rd., Suite 100 from 11 a.m.-2 p.m. on Saturday, Sept. 9 at the JDRF One Walk Rally being held at GlowZone. CASABLANCA IN MESQUITE OFFERS HEADLINING SHOWS AND BBQ FEST: CasaBlanca in Mesquite, about an 80-90 minute drive east of Las Vegas, features good entertainment with many acts from Las Vegas at cost-friendly prices. Upcoming shows include: Sept. 8 “Turn the Page: The Ultimate Tribute to Bob Segar and the Silver Bullet Band;” Sept. 9 at noon and 2 p.m. “Magic” by Seth Grabel previously featured on “America’s Got Talent;” Sept. 9 at 8:30 p.m. “ZZ Top Tribute;” and Sept. 15 “Guns N’ Roses Tribute.” The all-new CasaBlanca BBQ Fest featuring award-winning barbecue vendors will be held Friday-Sunday, Sept. 8-10 with a beer garden, entertainment, contests, games and children’s activities.